Special to the DailyThese blueberry buttermilk scones come together in less than 15 minutes and freeze beautifully. Are you stuck in a breakfast rut? Eating the same thing time after time can make the morning dull and your first meal of the day drudgery. Though it may initially seem daunting, it’s not hard to offer alternatives to your usual fare that will wake up your taste buds and make daybreak seem a little brighter. These blueberry buttermilk scones prove my point. They come together in less than fifteen minutes and freeze beautifully. So, all you have to do when you want to include a homemade pastry in your breakfast menu is defrost and reheat them. Add a pad of soft butter, some good preserves, and fresh fruit. Voila!, you’ve got a breakfast that appeals to the eye as well as the palate and gets the day off to a good start. Thanks to the acidity in the buttermilk and your very gentle handling (work the dough as little as possible), these scones will have a remarkably tender crumb. Their other noteworthy qualities are a mild sweet taste and the little nibbles of blueberry that add flavor and texture to every bite. Want to try a different dried fruit? It’s fine to do so, just chop or cut them so they are no larger than a raisin before adding them to the scone dough. Preheat the oven to 400 degrees, with a rack in the center position. Check your dried blueberries. If they aren’t soft and pliant, place them in a bowl with a little water, cover with plastic wrap and microwave for 20 second bursts, checking after each to see if the berries have softened. When they have, remove them from the oven, drain, and pat them dry before adding them to the dough. To make the dough in a food processor: Place the flour, granulated sugar, baking powder, baking soda, and salt in the bowl of a food processor and pulse until well mixed. Cut the cold butter into about twelve pieces and scatter them over the dry ingredients. Pulse until the mixture looks like course crumbs. Transfer the mixture to a mixing bowl. To make the dough by hand: Place the dry ingredients in a mixing bowl and stir to combine them well. Cut the butter into half-inch cubes and scatter over the top of the dry ingredients. Use a pastry blender, two forks, or your fingers, cut the butter into the dry ingredients until it resembles course crumbs. Whisk or stir the buttermilk, egg, and vanilla in a two-cup measuring cup or small bowl until combined. Add this to the dry ingredients and gently stir only until the dry ingredients are thoroughly moistened. The dough should be rough and shaggy; it will come together when you add the berries and form it into a circle. (Overmixing causes the scones to be tough). Fold in the dried blueberries. The dough will be stiff and a bit sticky. Flour your hands, turn the dough out onto an ungreased baking sheet, and gently pat it into an eight-inch circle. With a serrated knife, cut it into eight wedges of equal size. Move the wedges so they have about an inch between them. 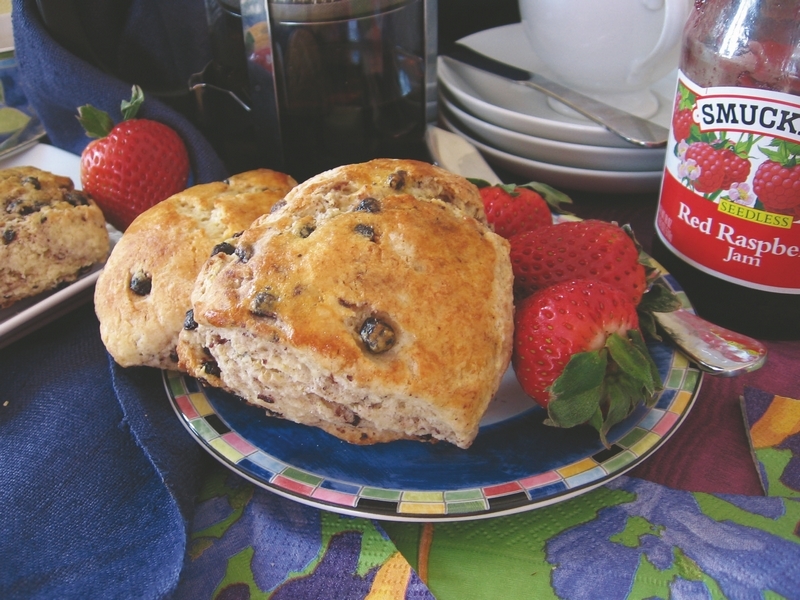 If using the egg wash, brush it lightly on the tops of the scones. Place the baking sheet in the oven and bake until the scones turn light golden and a toothpick inserted in the center of each comes out clean. This takes from 17-21 minutes in my oven. Remove the pan from the oven to a cooling rack. After a few minutes, use a spatula to transfer the scones from the pan to the rack. Serve them while they’re still warm or cool them completely and freeze them, wrapped airtight, for future use. Vera Dawson, a chef instructor at the CMC Culinary Institute, lives in Summit County, where she bakes almost every day. Her recipes have been tested in her home kitchen and, whenever necessary, altered until they work at our altitude. Contact Dawson with your comments about this column and/or your baking questions at veradawson1@gmail.com.